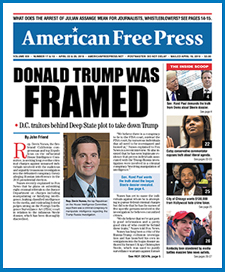 Recent attacks on AMERICAN FREE PRESS and its correspondents by high-level media forces have again brought into focus the issue of “conspiracy theories.” Conservative voices such as The Wall Street Journal and National Review have loudly expressed their view that it is absolutely beyond the pale that AFP puts forth alternative explanations that counter government-sponsored theories and the official “party line” on a wide variety of issues and events. Nor is it a coincidence—and let’s be up front about this—that it always seems to be Jewish groups and pro-Israel voices (such as the aforementioned publications, along with their allies at the Anti-Defamation League (ADL)) that are perpetually shouting about the “dangers” of “conspiracy theories”? The irony is that these very complainers—and the mainstream media—are first and foremost in talking, on virtually a 24/7 basis, about “conspiracies” (real or imagined—quite often the latter) they claim threaten the Jewish people or the survival of Israel and/or “democracy in America” and Western civilization, all of which are conflated to mean the same thing. Every day there’s something in a major newspaper, the big magazines or on the broadcast networks or the Internet about some conspiracy of this sort. And we are supposed to accept, as a matter of fact, that these conspiracies are real, whereas any other theories, not approved by the people who control the media, are not. It’s not just “The Holocaust” they talk about—and, of course, they talk about that all of the time. It’s worse than that. Regular “threats” harped on include “the rise of anti-Semitism,” accompanied by a host of terrorist plots by militia groups, “right-wing extremists” and Muslims. As the record shows, virtually all of these so-called plots seem to have been orchestrated, in the first place, by the Federal Bureau of Investigation (FBI) utilizing a shameless parade of its own generally quite suspect and rather sordid informants. And it just so happens that the aforementioned ADL—and groups such as the Southern Poverty Law Center—are always in the public eye (and behind the scenes) telling the FBI and other law enforcement precisely which alleged conspirators deserve to be targeted for special treatment. As far back as 1944—when President Franklin D. Roosevelt conducted a mass sedition trial aimed at Americans who had been critics of his drive to get the United States involved in World War II—it was the ADL that fed the FBI the “data” used to conjure up the sedition indictments against those Americans in the first place. It is a “myth,” they insist, that Jewish power predominates in the major media. Well, note that the following media outlets are all controlled by Jewish interests: ABC, CBS, NBC, CNN, MSNBC, Fox, The New York Times, The Wall Street Journal, New York Post, Daily News of New York City, The Washington Post, Los Angeles Times, Chicago Tribune and Time, along with the now-defunct (but long influential) U.S. News and World Report [In November 2010, U.S News & World Report switched to an online-only format, effective after it published its December issue, with the exception of print publishing special issues on colleges, hospitals, and personal finance.] and Newsweek. In truth, none of these publications are mentioned in the Protocols that, in fact, were crafted before many of these publications (and certainly before all of the broadcast networks) came into being. Is the Protocols really a “hoax”? Well, responsible research into its history demonstrates it was the work of a famous Jewish philosopher, Asher Ginsberg, who led one of the factions in the late 19th-century gatherings of the World Zionist Congress. While Ginsberg may have plagiarized language used in other works to flesh out the rhetorical foundation of the Protocols—leading to the fallacious claim the Protocols is a fraud—The New Babylon summarizes the actual history of this much-talked-about work. It is often also alleged that, in the 1920s—when automotive genius Henry Ford was publishing a newspaper critical of rising Jewish power in America—his reportage was based on the Protocols. Nothing could be further from the truth. Ford’s articles were thoroughly documented presentations examining the Jewish role in the American arena. And what’s so intriguing is that Ford’s articles of the 1920s reflect the same trends in America today. Simply change the names, and you’ll find a new breed of intriguers who are heirs to those of Ford’s day. And it is they who are the loudest in screaming about “conspiracy theories,” when, of course, they may well be the biggest conspirators of all. * Zionist media power was one of the many topics explored in The New Jerusalem: Zionist Power in America.